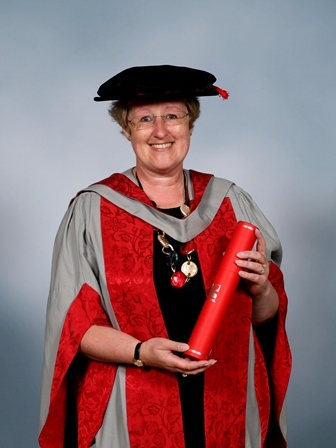 Lesley Cowley OBE was awarded the Honorary Degree of Doctor of Technology in recognition of her achievement and influence in the field of Technology and her contribution to STEM and STEM ambassadors in schools. The Honorary Degree was conferred at the Awards Ceremony of the Faculty of Environment and Technology on Tuesday 21 July 2015 at Bristol Cathedral. Lesley was born and raised in Bristol and left school at 17, initially working in sales and Credit Management. In 1990, she joined New College, Swindon, where she become Director of Corporate Services. The College offered her the opportunity to go to university and she became a UWE student, studying part-time for a Masters in Business Administration. She graduated with distinction in 1997. Her MBA studies resulted in an interest in the Internet and in 1999, she was appointed Operations Director of Nominet, the registry for .uk internet domain names. When she joined, there were 400k .uk registrations and 28 staff. She became Managing Director in 2002 and Chief Executive in 2004. She led the organisation through significant and transformational change for the next decade, at the end of which there were 10.5m registrations and 200 staff. In addition, she played a leading role in the establishment of the Nominet Trust charity, the UK's leading social tech funder. Lesley is active internationally on internet policy and governance. She is an elected Councillor of the country Code Names Supporting Organisation of ICANN. She was Chair of the Council for two terms and received the inaugural ICANN Award for Leadership in 2013. She is also active on the national stage and has served on many committees, including the UK Government Cyber Crime Reduction Partnership. She is currently a RUSI Independent Surveillance Review Panel Member and a Member of the British Computer Society Policy and Public Affairs Board. Lesley is a Fellow of the British Computer Society, the Chartered Institute of Credit Management, the Royal Society of Arts and the Institute of Directors. In 2007, Lesley won the Lloyds/CBI First Woman of Technology award. In 2011, she was named as the Institute of Directors S.E. & London Not for Profit Director of the Year and was made OBE, for services to the Internet and e-commerce. She was listed by Debretts and the Sunday Times as one of the 500 Most Influential People in the UK in 2014 and she became a Who's Who Entrant in 2015. Lesley left Nominet in 2014 to embark on a Non Executive Director career and was appointed the first ever Chair of the Driver and Vehicle Licensing Agency (DVLA). The DVLA maintains over 83m driver and vehicle records, collects £6b Vehicle Excise Duty each year, has an annual budget of £520m and employs 5,000 people. She is also a Non-Executive Director of aql, the award-winning telecommunications and data centre business and of CERT-UK, the government organisation that works with partners to enhance UK cyber resilience. Lesley has long been a passionate supporter of getting more women into IT leadership and Board roles and also a vocal advocate of careers in IT to young women. She is a founder of DNS Women, a global networking and support group for women working in the domain name system sector. In addition, she acts as a volunteer mentor and coach to women in IT.